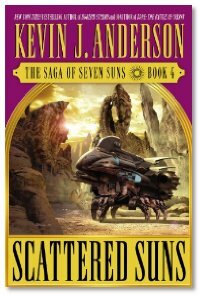 Scattered Suns by Kevin J. Anderson. This week Evo pulls yet another disapearing act and leaves Michael, Summer & Joe in the studio to talk with Kevin J. Anderson about his new book, Scattered Suns. It's a great conversation with a very talented writer. After that, Summer and Michael fire up Skype for an international call to Gerard Readett. Gerard's New book is called Roadworks, and deals with a futuristic world where traffic is taken over by computers. Of course the problem with that is computers crash, and things go boom. Bahahahahaha. Fluff the wood indeed. Roadworks reminds me of an old story, whose author just slips my mind, called "The Roads Must Roll", in which a union shuts down the transportation system. Wonder if Readett might have drawn from that? A very cool story, btw. Actually I've never heard of The Roads Must roll although I have read some of Heinlein's books. In Roadworks the road, rail and underground networks are deliberately crashed, the inner city car parks are blocked and terrorists menace to blow up hotels where the heads of state of the Western World are staying for a NATO conference. Some of the ideas might seem familiar but as far as I'm aware no one has yet brought all of them together. Also the terrorists demands are for the West to spend a small part of their military budgets for humanitarian purposes.